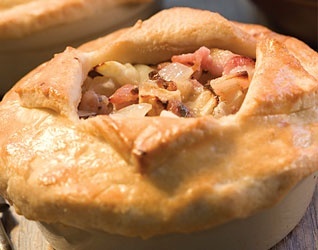 Fidget pie is a traditional English meal containing apples, onions and ham. I don’t remember my grandmother ever making this recipe, but she had it tucked away in her recipe book from my grandfather’s family from England. Turn it into a proper harvest lunch with some country bread and piccalilli. Prepare the crust and have it ready to fill. Refrigerate it until the ingredients have been prepared. Preheat the oven to 425 degrees F.
Slice the potatoes about 1/3” thick and toss them with the olive oil and a pinch of salt. Roast them in the hot oven for ten minutes. You want them to be somewhat cooked, but not crisp. Allow them to sit on the baking sheet for at least ten minutes before removing. (They’ll come up much more easily, if you do.) You can do this step in advance and store the potato pieces, tightly covered, in the refrigerator for up to 24 hours. Warm them gently, though, before assembling the pie. In a heavy skillet, cook the onion slices in two tablespoons of butter (or bacon fat, or a combination of the two) with a pinch of salt over medium heat, stirring occasionally, for at least ten minutes, or until lightly browned. Remove the onions with a slotted spoon and set aside. In the same skillet (without wiping it), melt the remaining tablespoon of butter or bacon fat and sprinkle the flour over it; cook over medium heat, stirring constantly, until you have a somewhat dry paste. Continue to stir while cooking until the mixture becomes a light, nutty brown color. Add the chicken broth slowly, stirring constantly. Add the thyme leaves, continuing to stir. Slowly add 1/2 cup of the apple cider and stir well. Cook for about two minutes, add whatever juices have collected in the bowl with the onions, and cook for another minute, stirring. Add the mustard, the cider vinegar and the cooked onions and stir to combine. 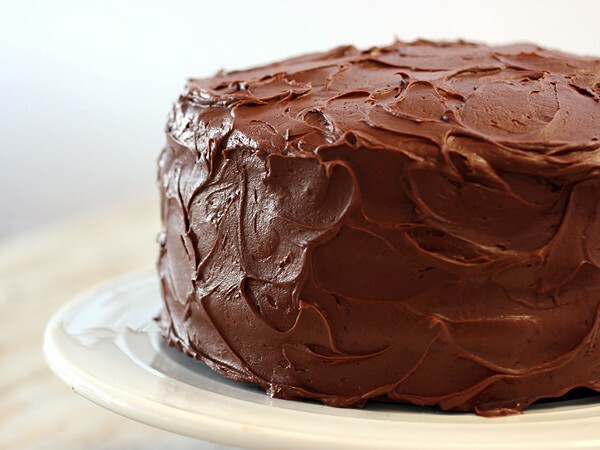 You can do this step in advance and store the mixture, tightly covered, in the refrigerator for up to 24 hours. Warm it gently, though, before assembling the pie. In the bottom of the prepared pie shell, layer the cheese, then the potatoes, then the ham, then the onion mixture, and then the apples. If you are adding Brussels sprouts, add them between the ham and onion mixture layers. Slowly pour the remaining 1/4 cup of cider over the filling. Sprinkle the nutmeg, a good pinch of salt and freshly grated pepper, to taste, over the pie filling. Vent by cutting 1 ½ inch slits around the outside edge and in the middle. Cut as a vent in the center of the pie the initial of someone who will be at the table when you serve it. This is very important. Cook at 425 degrees for 15 minutes. Reduce the heat to 350 degrees F and cook for another 45 minutes. Check after the pie has been in the oven for a total of 20-25 minutes; if necessary, cover with a foil frame or whatever method you prefer to prevent the crust from getting too dark. Serve with roasted carrots and roasted Brussels sprouts or broccoli (if you’re not cooking the Brussels in the pie). If you are using lard, make sure that it is at room temperature before you begin making the crust. In a medium bowl, whip the boiling water and hot milk into the lard or shortening with a fork until the fat melts and the ingredients are combined. Allow to cool to lukewarm. Add the flour and the salt and stir well until combined. Divide into two, with one piece — to be used as the top crust — slightly larger than the other. Quickly gather up one portion and wrap it in plastic wrap. While in the wrap, shape the dough into a rough disk about six inches in diameter. Put it into the refrigerator. Do the same thing with the other half of the dough. Roll out each piece between two large pieces of plastic wrap (or a pie crust bag, if that’s what you typically use), lightly flouring the bottom piece, and lightly flouring the top of the dough. If you’ve refrigerated it overnight, it helps to let it sit on the counter for ten or fifteen minutes before rolling. Put one rolled crust in a 9-inch pie plate, removing the bottom sheet of plastic, and leaving a half-inch overhang of dough. Keep the other piece of plastic on it, tucking the edges so that the crust remains wrapped. Wrap the edges of wrap on the other crust so that it is fully covered as well. Return both crusts to the refrigerator until you’re ready to assemble the pie. Hams, especially those to be baked, often benefit from soaking before cooking. This is because soaking removes some of the excess salt from the meat. Cover the meat completely with cold water. Stand for 12-24 hours in cold water, preferably in the fridge if you live in a hot climate. Weigh the ham and calculate the cooking time. Allow 25 – 34 minutes per pound. Take the ham out of the soaking water and place the ham in a large pot and cover with fresh, cold water. Bring to the boil. Add sprigs of parsley, thyme, a bay leaf, peppercorns and 1 – 2 sliced onions. Cover the pan and simmer the ham over a low heat for the required time, or until tender when pierced. Lift out, and allow to drain. Remove the skin, glaze if required. Serve hot or cold. Weigh the ham and calculate the cooking time for your pork recipes. 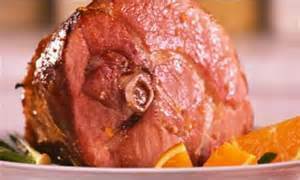 Allow 25 – 35 minutes per 1 pound for hams under 13 pounds, and 15 minutes per 1 pound for hams 13 pounds and over. Soak the ham, then place on a rack in a large roasting pan. Insert a meat thermometer, if available. Bake in a preheated oven, 325 degrees F, for the required time, or until the meat thermometer reaches 158 degrees F.. Remove the skin, glaze if wished and serve the ham hot or cold. Here are 4 different recipes for curing ham, all are different but equally good. The first two recipes are for dry curing of the ham and the other recipes are putting the legs of pork in brine. If you live in a hot climate dry curing is not a good idea as your meat will spoil and not be fit for human consumption. However, if you are going to cure your hams when the weather is cold, for every day that the temperature reaches freezing point you should add an extra day to your ham curing process. Grind all the herbs, Take 6oz curing salt and mix well with the 20lb rock salt, then add the herbs and spices and mix thoroughly. Wash the hams and dry thoroughly. Put a bed of salt in a container and lay the hams down, making sure the container has a hole in the bottom to let excess fluid run off, Cover completely with the ingredients and leave until it is a good color. After a week, break the pack, re-salt and place the hams skin down. Cover completely with salt and leave for one month. After a month take them out, wash thoroughly and tie a piece of good quality cotton twine around the hocks. Hang them up to mature for a week. After a week, take them down and insert a long needle into each ham. Withdraw the needle and smell it. The aroma should smell fresh. If it does, take a small piece of fat, cover it with pepper and block the hole up with it; this prevents bacteria invading the ham.The next thing to do is to put the hams in the smoke house and smoke them using beech, for about a week. Take out cool, and put them in a cotton bag to mature. These hams can keep for 12 months. They must be boned out very carefully and left under a press to compact the shape. When dry curing ham cover the hams completely with a layer of salt for 3 days. Once all the fluid has been removed, apply the curing mixture. For the cure: mix together the curing salt, salt, black pepper and coriander, Bone out the leg of pork and then apply the ingredients inside and out. Where you have taken the bone out, put some of the ingredients in, using 1oz to 1lb and then sew up near the hock to give a good shape to the ham. Put the leg in a curing net to keep the shape. Do not hang it up but lay it down so it does not lose its shape. Cure for 10 days, then fetch it out and wash it off. Apply the garlic and wine vinegar to the dry ham and put under a wooden press. Press into shape and leave for another week or so until it is completely hard. Take out the ham, rub it with garlic and vinegar and put in a muslin cloth. Hang up in an airy place and leave for about a month. You may find mold when you remove it from the cloth. If the mold is white that is fine, just wipe it off with a cloth. However, if it is black this is not good, Rub it off with some more vinegar and re-wrap in a clean muslin. Boil all the ingredients together for 20 minutes and cool before pouring it over the meat. Find a large, clean container and place the meat inside and cover with the brine mixture completely. Leave it there for 3 weeks, then wash, and dry it off. Cover with a piece of muslin and hang it up to dry in an airy place. You can also place it up the chimney and allow it to be smoked from the smoke from the wood fire if your have a large enough chimney. This sugar curing ham recipe is a little different in that you salt up the ham first, and then place it into a solution that is almost like a pickle concoction. It also doesn’t contain any saltpetre so it is a safer and healthier option. Take your pork leg and rub it with salt for 3 consecutive days. Then submerge your salted pork leg in the following pickle solution for 3 weeks. Boil the ingredients for 20 minutes in a large pot, remove from heat and cool. Submerge your pork leg completely in the solution and leave it there for 3 weeks. Take it out, and without washing it, allow it to air-dry slowly. For every 100 pounds of meat take 5 pints of good molasses or 5 pounds of brown sugar, 5 ounces curing salt, 8 pounds of rock salt and add 3 gallons of water to a pot. Boil over a gentle heat, removing scum as it rises. Continue boiling until the salt and sugar have dissolved. With the meat cut and trimmed, pack the hams into the cask with the shank end down. Once the liquid has cooled poor over the hams in the cask making sure that they are completely covered. The hams can lie in the pickle 2 – 6 weeks depending on the size of the hams, the time of the season etc. The warmer the weather, the shorter the time. This recipe is a good substitute for curing ham rather than smoking or drying it. This German Pork Hocks Recipe “Schweinshaxe” is perfect, not just for Oktoberfest, but anytime you want something traditionally German. Called “Eisbein” in northern Germany and “Schweinshaxe” in the southern part, it is often cooked from fresh, rather than smoked hocks. There are two main methods for cooking pork hocks. This one uses both cooking on the stove and finishing off in the oven. May sound like extra work. It really isn’t and the results are worth it! Put vegetables, 1 tsp salt, 1 tsp peppercorns, and pork hocks in pot. Add water to cover, bring to boil, reduce heat to simmer, and cook until hocks are just tender – about 2 – 3 hours. Do not overcook. Drain, keeping vegetables and cooking liquid. To baking dish (if cast-iron pot is use, add 2 tbsp. of oil), add drained pork hocks, drained cooked vegetables, and a small amount of the cooking liquid. Bake 30 minutes, occasionally basting meat with cooking liquid. 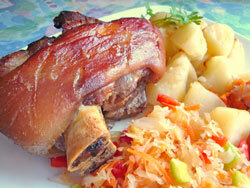 Serve meat with potatoes and sauerkraut. If desired, serve the cooking liquid (thicken with corn starch if desired). Add a bit of cumin to liquid if desired. In a saucepan, boil the peeled potatoes in salted water 6 to 8 minutes. Grease a roasting pot and sprinkle half the onions in the bottom of the pan. Place the pork chops on top; sprinkle with the pepper. Arrange the potatoes around the chops. 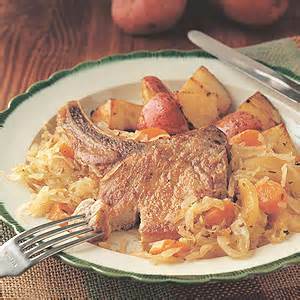 Top with the sauerkraut, add the stock. Drop in the whole cloves, if used. Cover and bake for 2 hours. Serve hot, adding some of the cooking juices to each serving. Please note that this recipe requires marinating the pork for 2-24 hours before cooking. Combine the ground mustard, garlic powder, allspice, 2 teaspoons salt, black pepper, balsamic vinegar and olive oil in a re-sealable plastic bag. Add pork and shake to distribute the marinade. Squeeze out air and seal bag. Refrigerate and marinate for at least 2 and up to 24 hours or overnight. Preheat oven to 350°F. Place marinated pork into a glass baking dish along with the marinade. Bake while basting 3-4 times until the pork reaches an internal temperature of 145°F; about 1 hour. While the pork is cooking prepare the cauliflower. In a large bowl, toss the cauliflower with the extra virgin olive oil, rosemary and 1/2 teaspoon salt until well coated. Arrange on baking sheet in a single layer. Bake along with the pork for 40-50 minutes until lightly browned and tender. Allow the pork to rest 5-10 minutes before serving with the cauliflower.